The BC Agora Portal (Links to an external site.) is the primary way to access Canvas. After logging in, click on “My Courses” in the “My Services” tab. Clicking on the Canvas icon for your course will direct you to your course’s home page in Canvas. Additionally, Canvas can be accessed through the direct web address: bc.edu/lms (Links to an external site.). 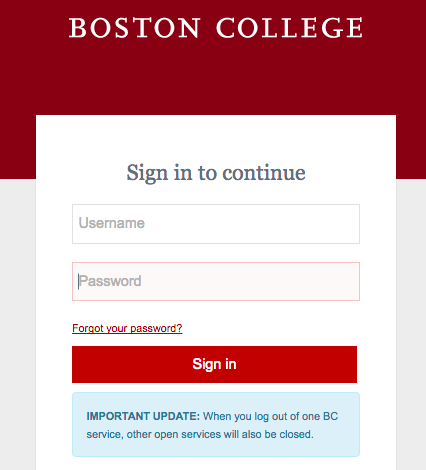 If you are not already logged into Boston College, then it will prompt you to log in with your BC credentials. The Dashboard will appear. You can access a course by clicking on its course tile, or by clicking “Courses” in the global navigation menu on the left side of the page. If your course does not appear on the Dashboard or list under “Courses,” select “All Courses.” A list of current and past courses will list on the next page. Click the star icon to “favorite” courses so that they display on the Dashboard and in your course menu.